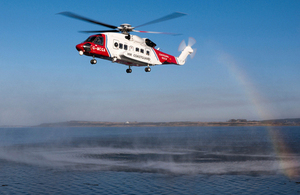 Three men have been rescued from a life raft by the Stornoway Coastguard rescue helicopter. Stornoway Coastguard received a VHF DSC distress alert from the fishing vessel Osprey at 6.37pm on Wednesday 23 July 2014, which included a GPS location for the vessel. Stornoway Coastguard sent the helicopter to the scene and requested the launch of Lochinver RNLI all weather lifeboat to the incident 10 miles south west of Cape Wrath. When the Stornoway Coastguard rescue helicopter arrived in the area they quickly located the vessel which was found within one mile of the distress alert position and still afloat. The three crew were alongside in a life raft and the vessel sank shortly afterwards. All three crew were winched into the aircraft and transferred to the Western Isles Hospital at Stornoway to be checked for hypothermia.